Shortly after finishing University I bought myself a copy of 'The Cake Bible' by Rose Levy Beranbaum, still available at major book sellers. This 1988 book has been used frequently over the years, though it's most useful recipe is that for 'Marion Cummingham's Raised Waffles'. These are a special occasion standard, usually being reserved for Christmas morning. I have lately been amused by the reports of people hoarding boxes of 'Eggo' waffles due to the shortage that is expected to last into mid 2010. After eating the waffles from this recipe, you'll never want to eat freezer type waffles again. In a large mixing bowl (at least 3 quarts in capacity) combine the warm water (110F), sugar, and yeast. Stir and let stand 10 to 20 minutes to proof. If the yeast is active, it will produce many bubbles. Add the milk, butter, salt, and flour and beat until smooth and blended. Cover the bowl with plastic wrap and let stand overnight at room temperature. The batter will rise from 4 cups to 12 cups and then collapse. Preheat the waffle iron until it is hot enough to sizzle a drop of water. Beat in the eggs. Add the baking soda and stir until well mixed. The batter will be very thin. 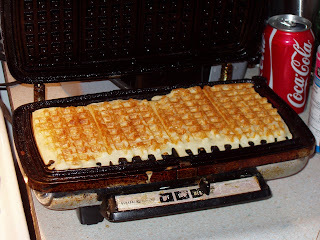 Pour the batter onto the center of the waffle iron, using a light hand because the batter will spread when the lid id lowered. We like to serve ours with fresh fruit, whipped cream and real maple syrup. This time I didn't have enough butter, so used 3 tablespoons butter and 1 tablespoon oil. They took longer to brown but still tasted wonderful. Darilyn over at 'Tropical Screamer' has posted a recipe for quick Chicken Quesadillas. Karen over at 'Quilts... etc' has posted a wonderful Oatmeal Pancake recipe. I was clicking the 'next blog' button and came across a recipe for 'Instant Chai' at Mik Knits, Crochets...' and wanted to share it with you. 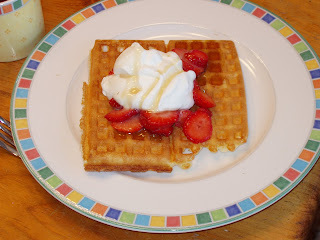 that recipe looks good and I have printed it out - thanks for sharing - yes I don't know how anyone can stand all those frozen pre-made waffles - I really can't stand them! weird how many depend on them and the shortage will affect them. Make up a large batch of homemade on the weekend and freeze them yourself. Too funny -- I haven't heard of the Leggo shortage, but then we don't eat frozen waffles. I have The Cake Bible but I didn't remember that there was a waffle recipe in it. These sound terrific and I'm going to have to try them. Thanks for linking up with Weekend Cooking.